Yesterday it was raining all day and in an Indian household rain is associated with fried food specially pakoras which are also called as fried fritters. 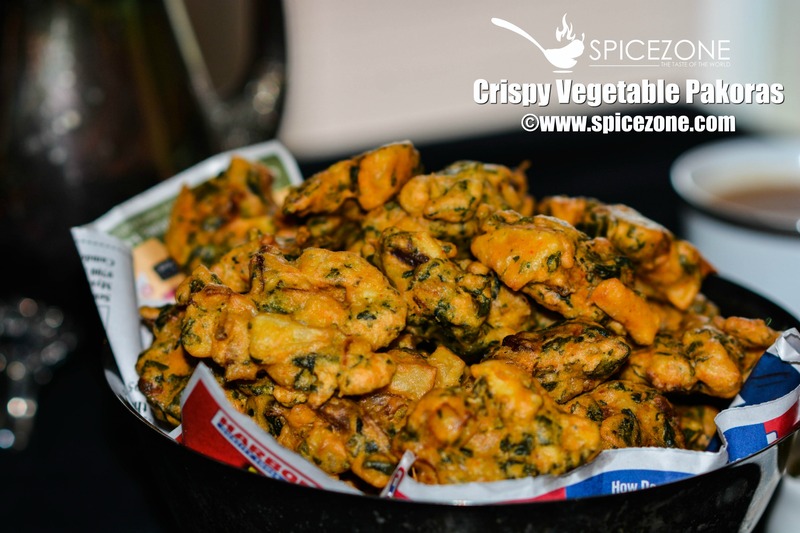 My husband was out of town for a few days on a business trip and I thought it will be a good idea to make Crispy Vegetable Pakoras as it is raining and I am sure he must be craving some home cooked food. 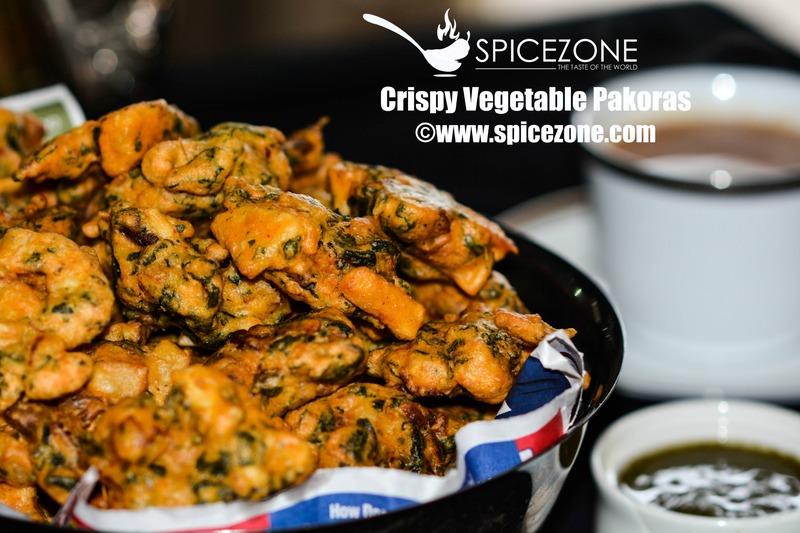 Pakoras are an all time favorite snack in India. 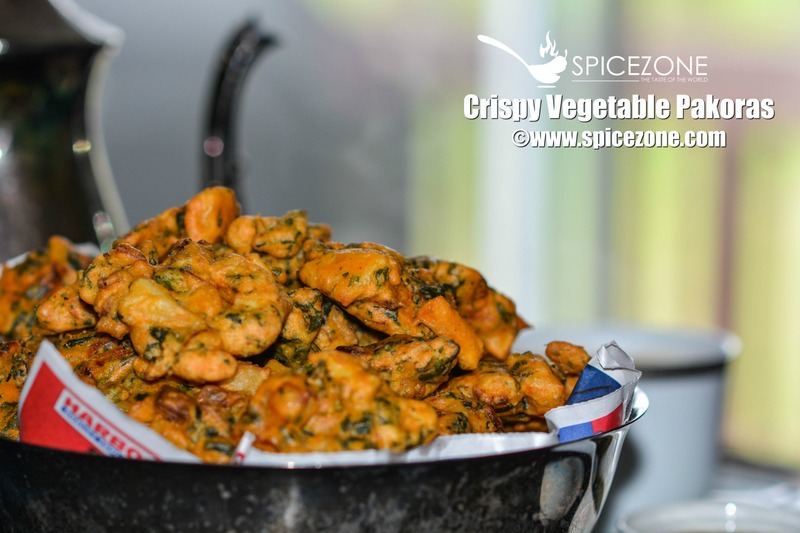 These can be made individually by dipping the vegetables like potatoes, cauliflower, onion, spinach into the batter one by one. For this you cut the veggies into bite size and dip them. I looked in my fridge and saw there was no other veggies so decided to mix potato, onion and frozen spinach along with the spices. You can enjoy these fritters as a snack or breakfast too. It is one of easiest appetizer you can prepare when you have an unexpected guests over. It is called with different names in different parts of India. In Mumbai, they call it bhajiyas, Delhi it is called pakoras, but they all are referring to the same dish. Cut all the veggies, wash and drain them. In a mixing bowl, add the veggies, along with the besan and all the spices. Add water slowly to make the batter. Add water little by little and keep mixing everything using your hand. The batter should be too thick or too runny. Heat the oil in a kadhai or a frying pan. Once the oil is hot turn the heat to medium. Using you hand, drop the vegetable and besan mix batter slowly into the oil little by little. If you are not comfortable using your hand, you can spoon the mixture and put it in the hot oil. You got to be careful so that the oil doesn't splash on you. Depending on the pan your are using, you will put as many at one time. Don't put too many as you have to turn them. Fry them on the medium heat turning as needed until you see a little color and are crispy. To get crispy pakoras, you should fry them on medium heat. Repeat the process until the entire batter is finished. Once they are done, sprinkle chaat masala on it. Serve hot with your favorite mint or tamarind chutney along with a hot cup of ginger tea. Crispy Vegetable Pakoras are a must make appetizer on a rainy day with a hot cup of tea and tangy chutneys to tickle your taste buds.